Inconsistent Rules Create Uneven Application of Standards. 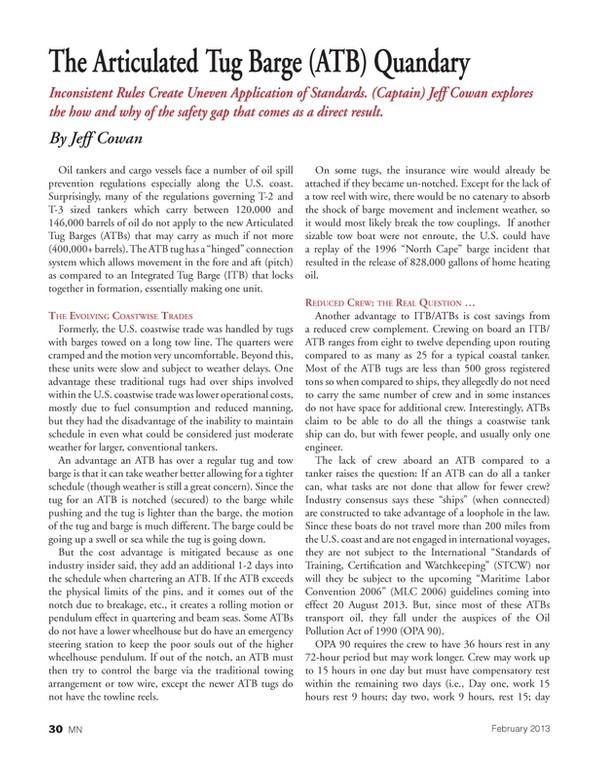 (Captain) Jeff Cowan explores the how and why of the safety gap that comes as a direct result. Oil tankers and cargo vessels face a number of oil spill prevention regulations especially along the U.S. coast. Surprisingly, many of the regulations governing T-2 and T-3 sized tankers which carry between 120,000 and 146,000 barrels of oil do not apply to the new Articulated Tug Barges (ATBs) that may carry as much if not more (400,000+ barrels). The ATB tug has a “hinged” connection system which allows movement in the fore and aft (pitch) as compared to an Integrated Tug Barge (ITB) that locks together in formation, essentially making one unit. Formerly, the U.S. coastwise trade was handled by tugs with barges towed on a long tow line. The quarters were cramped and the motion very uncomfortable. Beyond this, these units were slow and subject to weather delays. One advantage these traditional tugs had over ships involved within the U.S. coastwise trade was lower operational costs, mostly due to fuel consumption and reduced manning, but they had the disadvantage of the inability to maintain schedule in even what could be considered just moderate weather for larger, conventional tankers. An advantage an ATB has over a regular tug and tow barge is that it can take weather better allowing for a tighter schedule (though weather is still a great concern). Since the tug for an ATB is notched (secured) to the barge while pushing and the tug is lighter than the barge, the motion of the tug and barge is much different. The barge could be going up a swell or sea while the tug is going down. But the cost advantage is mitigated because as one industry insider said, they add an additional 1-2 days into the schedule when chartering an ATB. If the ATB exceeds the physical limits of the pins, and it comes out of the notch due to breakage, etc., it creates a rolling motion or pendulum effect in quartering and beam seas. Some ATBs do not have a lower wheelhouse but do have an emergency steering station to keep the poor souls out of the higher wheelhouse pendulum. If out of the notch, an ATB must then try to control the barge via the traditional towing arrangement or tow wire, except the newer ATB tugs do not have the towline reels. On some tugs, the insurance wire would already be attached if they became un-notched. Except for the lack of a tow reel with wire, there would be no catenary to absorb the shock of barge movement and inclement weather, so it would most likely break the tow couplings. If another sizable tow boat were not enroute, the U.S. could have a replay of the 1996 “North Cape” barge incident that resulted in the release of 828,000 gallons of home heating oil. Another advantage to ITB/ATBs is cost savings from a reduced crew complement. Crewing on board an ITB/ATB ranges from eight to twelve depending upon routing compared to as many as 25 for a typical coastal tanker. Most of the ATB tugs are less than 500 gross registered tons so when compared to ships, they allegedly do not need to carry the same number of crew and in some instances do not have space for additional crew. Interestingly, ATBs claim to be able to do all the things a coastwise tank ship can do, but with fewer people, and usually only one engineer. The lack of crew aboard an ATB compared to a tanker raises the question: If an ATB can do all a tanker can, what tasks are not done that allow for fewer crew? Industry consensus says these “ships” (when connected) are constructed to take advantage of a loophole in the law. Since these boats do not travel more than 200 miles from the U.S. coast and are not engaged in international voyages, they are not subject to the International “Standards of Training, Certification and Watchkeeping” (STCW) nor will they be subject to the upcoming “Maritime Labor Convention 2006” (MLC 2006) guidelines coming into effect 20 August 2013. But, since most of these ATBs transport oil, they fall under the auspices of the Oil Pollution Act of 1990 (OPA 90). OPA 90 requires the crew to have 36 hours rest in any 72-hour period but may work longer. Crew may work up to 15 hours in one day but must have compensatory rest within the remaining two days (i.e., Day one, work 15 hours rest 9 hours; day two, work 9 hours, rest 15; day three, work 12 hours rest 12 hours, etc.). This raises the question: Who works in place of the hypothetical crewman on Day two? Remember, this all transpires aboard a vessel carrying a limited crew size and transporting between 120,000 barrels to 400,000 barrels of oil. Do these vessels sit idly alongside the dock or at anchor to allow the crew rest? What work is not being done if no one is assigned to cover during rest hours? In California, there are berths that require some ATBs to tie-up with 16 mooring lines. Luckily, most of these lines are stored on reels but it takes people to lead out these lines, throw the heaving line, bend the heaving line onto the mooring line, slacken the line reel and finally tighten that line on the reel. Depending upon personnel available, the process could take hours depending upon type of line, which would impact the rest period for some crew. Ships engaging international routes must use the International Safety Management System (SMS). Procedures must be documented; records maintained for inspections; maintenance kept and used in the spirit of safety. The SMS works if used as set down in the International Safety Management Code. Besides performing required inspections and maintenance, these iterations must be documented by someone. On a ship with 23 crew it can it be done effectively. Given the perceived need to administer SMS in the as yet unreleased 46 Code of Federal Regulations (CFR) Subchapter M, how does a tug with a crew of eight accomplish the same documentation level when involved in coastwise trade with numerous port calls/evolutions? In addition, due the limited size of these boats, they do not have the capacity to carry enough spare parts or sustain an effective machine shop, so shore crews perform most of the maintenance and repairs. What happens at sea when one of the generators is lost and a cargo/ballast pump ceases function simultaneously? Keep in mind that an ATB usually only carries one engineer among the crew. A ship carrying the same amount of cargo as the tug/barge will typically have seven, one Chief Engineer, a minimum of three licensed engineers, at least three unlicensed crew in the engine department, a sizable machine shop and spare parts inventory. Since 2001, for ships engaged in international voyages follow the “International Ship and Port Facility Security Code” (ISPS) and every ship must have security measures in place or risk losing trading privileges if their International Ship Security Certification (ISSC) is pulled. Domestic vessels must adhere to U.S. 33CFR 104 which mimics the ISPS and states among other requirements “that vessel access, including the embarkation of persons and their effects, is controlled.” With a limited crew, pumping cargo, tying up/letting go, performing sea watches, routine maintenance and inspections, ATB crews have a lot on their plates. The UK and Maritime and Coastguard Agency (MCA) recently published a study on fatigue and stated that “if the numbers of people fall short of what is required to carry out a task, then workload, fatigue, stress levels and sickness are increased; short-cuts are taken, and the safety culture is compromised by demotivation, low morale and absenteeism. Management efficiencies (staff cuts) often result in unsafe working efficiencies (shortcuts), a decrease in thoroughness and an increase in the number of mistakes – all made worse due to fewer people having less time to prevent those mistakes developing into something worse.” To maintain operations with a small crew (8), what shortcuts must ITB/ATB operators take? In the 1990s, the State of Washington tried to mandate as part of their Best Achievable Protection Regulations that two licensed deck officers be on duty with a helmsmen and lookout while navigating or at anchor in state waters (among other practices). The Independent Tanker Owners (Intertanko) brought suit, citing conflicts with the Commerce Clause among other facets of law. Under United States vs. Locke, the Supreme Court struck down the Washington mandate for watchkeeping since Federal law supersedes State law when the vessel is involved in interstate commerce. While this writer attended different meetings with U.S. Federal employees, conversations drifted toward the operation of ATBs, and they often expressed reservations regarding the crewing aboard these boats and the amount of oil they transport. These individuals separately, at different times stated, “Something will have to happen for the regulations to change for ITB/ATBs.” Taken in perspective, the tankship Exxon Valdez spilled 11 million gallons of oil in Prince William Sound; the container ship “Cosco Busan” spilled 53,000 gallons of oil in San Francisco Bay; and one of these ATBs has the potential to spill 12 million gallons (400,000 barrels) and with only eight crewmembers. With that risk, why will it take an oil spill of a magnitude in the millions of gallons to change regulations?